How’s that for a title to catch your attention? Thomas Keller is a world famous chef and owns multiple restaurants. He published a beautiful book on sous-vide cooking called “Under Pressure”. In this book he writes that lobster tail should be cooked sous-vide for 15 minutes at 59.5ºC/139ºF, and many websites have published this temperature as well as Thomas Keller is considered to be a reliable source. I performed an experiment with lobster tail sous-vide about two years ago, and found that I preferred 46ºC/115ºF over 50ºC/122ºF. Those are two temperatures that are recommended by Modernist Cuisine (they also mention 54ºC/129ºF). At the lower temperature, the lobster meat was more tender, less ‘springy’, and more juicy. I never even tried it at Thomas Keller’s suggestion of 59.5ºC/139ºF, as going even higher didn’t seem like a good idea. I’ve had some reactions of readers doubting whether to go with 46ºC/115ºF as per my experiment, or to play it ‘safe’ and go with Thomas Keller. Since I hadn’t actually tried the temperature suggested by Thomas Keller, I thought I should repeat my experiment but with 46ºC/115ºF compared to 59.5ºC/139ºF to make out once and for all what’s better. I brought a pot of water to a boil and killed two lobsters of equal size. I twisted off the tails and plunged them into the boiling water. I turned off the heat and allowed the lobster tails to steep in the hot water for a minute. This step is needed to make it easier to remove the lobster tail meat from its shell. …and plunged them in ice water to cool them off and to stop the cooking. I could then easily take the lobster meat out of the shells. I vacuum sealed the lobster tails separately with a tablespoon of butter. I then cooked one for 15 minutes at 46ºC/115ºF and the other for 15 minutes at 59.5ºC/139ºF. The proof of the pudding lobster is in the eating. The lobster tail cooked at 46ºC/115ºF was more tender, more juicy, and less rubbery than the lobster tail cooked at 59.5ºC/139ºF. The lobster tail cooked at the higher temperature was still nice, just not as nice as the lobster cooked at the lower temperature. 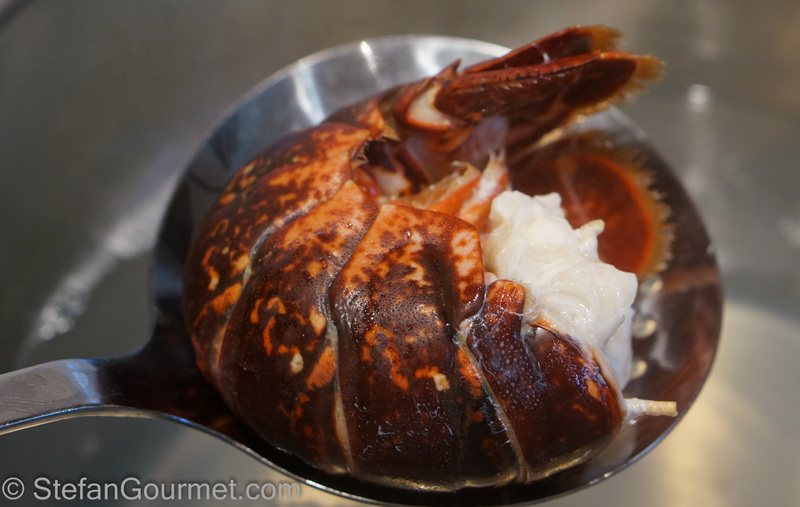 The lobster tail cooked at the higher temperature was more like a regular steamed lobster tail, without the benefits of sous-vide that are obvious in the lobster cooked at 46ºC/115ºF. Please note that this is my personal taste. You may actually prefer lobster cooked at 59.5ºC/139ºF because you are used to eating it that way. Now I wonder whether Thomas Keller actually uses the temperatures published in his book “Under Pressure” in his restaurants, as all the temperatures shown for fish are too high (all around 60ºC/140ºF, including bass, mackerel, St. Peter’s fish, and even tuna). Americans can be overly cautious when it comes to food poisoning, especially when there is a risk of lawyers getting involved. Seafood cooked long enough at 60ºC/140ºF is pasteurized and therefore safer to eat than fish cooked at the ‘right’ temperatures between 43ºC/109ºF and 48ºC/118ºF as published by me on this blog and by Modernist Cuisine. However, if the seafood is fresh, it is already safe to eat when it is still raw. Safer than safe isn’t necessary, and I agree wholeheartedly with Modernist Cuisine that you can’t pasteurize fish without overcooking it. I’ve never eaten at Thomas Keller’s restaurants, but I would not be surprised at all if he uses lower temperatures there. It goes without saying that you can’t get any fresher (and thus safer) than a live lobster you just killed yourself a minute before cooking it. Easter is coming up, and this bread stuffed with raisins and almond paste is perfect for the occasion. It is called “paasstol” in Dutch, and is the same as a “kerststol” that is baked for Christmas. I have never tried the temperature you recommend. I have been meaning to since you mentioned it to me on a comment on my blog a few weeks back in response to a post about lobster cooked the “keller” temperature. I have not cooked lobster since then so I have not gotten a chance to try it but I definitely will. The one I have tried based on Keller’s time and temperature is always amazing though, never ever rubbery. More like springy and perfectly cooked while being tender and moist. Subjectivity aside, there is a variable or two that I do not think you are accounting for. Keller does not ever boil the lobster meat or drop a tail in boiling water. His method uses a whole lobster and basically he dumps boiling water on it in an insulated cooler and let’s it sit. It’s a bit more involved than that but that is the jist of it. This leaves the lobster meat basically raw but easy to remove from the shell. Could this account for the variation between the two tails you are using making the one cooked at a higher temp a bit more rubbery? The other variable is the cooking fat. Really Keller’s method if it should be followed to the letter per “Under Pressure”, uses a tub of beurre monte, yes a tub of butter that is being controlled by an immersion circulator! 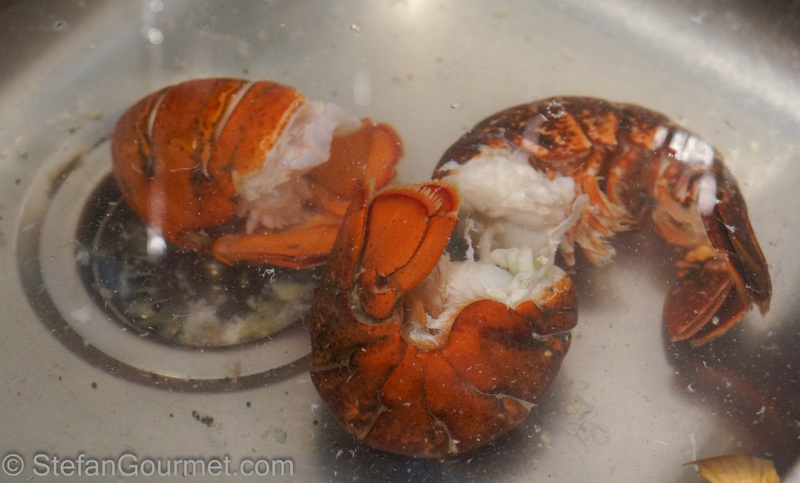 The lobster is gently butter poached directly in there not being put in plastic pouches. I saw the vats of butter at The French Laundry when we ate there…amazing! To simulate that I simply melt plenty of butter and put them in the bag with the lobster meat. All that being said, you are very correct about the American hypersensitivity to anything remotely smelling of “unsafe”. I hate that, but I’ll leave it alone for now. I’ve already yapped too much. Please note that I did not write that I replicated lobster as served by Thomas Keller in his restaurants, or even lobster as described in his book. I am not saying that the lobster I cooked at 59.5C/139F is the same as served by Keller, as indeed as you point there are numerous differences. I am also not saying that the lobster tail cooked at 59.5C/139F was bad tasting. In fact it was great: tender as well as moist. The lobster tail cooked at 46C/118F was just slightly more tender and slightly less springy. I merely compared two temperatures for cooking lobster sous-vide, keeping all other variables constant within my experiment. The only difference between the two lobster tails was the cooking temperature, nothing else. 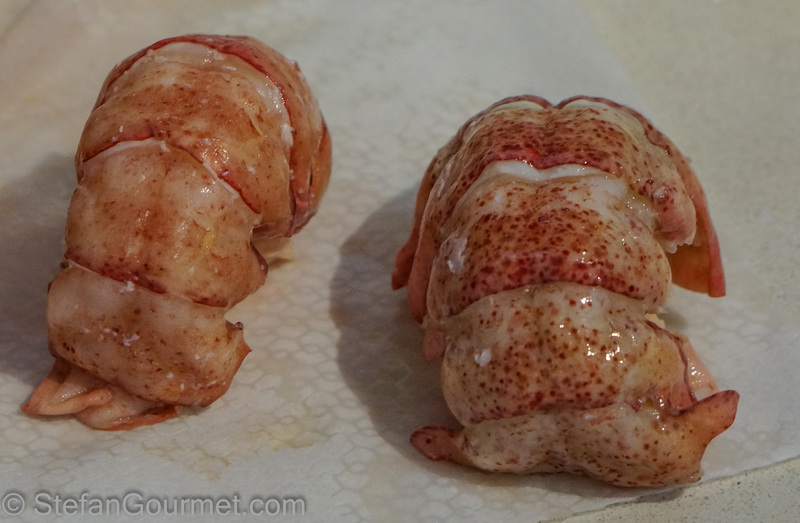 And since I noted a clear difference in texture between the two lobster tails, I think it is safe to assume that it was the cooking temperature that caused the difference. If it was the boiling water that caused the texture, that boiling water would have had the same effect on both lobster tails and not just on the one that was subsequently cooked at 59.5C/139F. By the way, I agree that “rubbery” may be too strong a word to describe the texture, and “springy” is a better one. Some people actually like lobster to be springy. Although I’ve never been to his restaurant, I’m sure Thomas Keller’s lobster is delicious. I think lobster can be even more delicious by cooking it at a lower temperature, and I believe that, at least in the book, he advocates cooking temperatures that are ‘safer’ without explaining the trade-off between safety and texture that was made. Perhaps it was his lawyer or editor that did this, but it is his name on the cover. Thomas Keller states in his book that he refrigerates all his sous vide food for a minimum of 6 hours after he vacuum packs them. Do you think starting at the cold refrigerated temperature and cooking it at the higher temperature for the same 15 minutes would produce equal or better results than you found cooking at 15 minutes at a lower temperature but starting with a hotter lobster tail? Hi Jared, starting at refrigerated temperatures does affect the cooking time (as it will take longer to reach the target temperature) but it does not affect the cooking temperature. When cooking seafood sous-vide, you only keep it in the water bath long enough for the core to reach the same temperature as the water bath. The time will therefore depend on the size (especially thickness) and of the difference between the starting temperature and the target temperature. The temperature will determine the texture. Generally speaking, a higher temperature will lead to seafood that is tougher and drier. In conclusion, I do not believe that using the higher temperature will produce equal or better results. However, this is a matter of personal preference, as some people like their lobster to be more springy rather than tender (just as some people prefer well done over medium rare when it comes to steak). Stefan, i think you’re right. There’s a bit of a misguided obsession about food safety and cooking temperatures in the US as far as I could tell living there for so many years. Lots of lawyers ready to make money like you said. 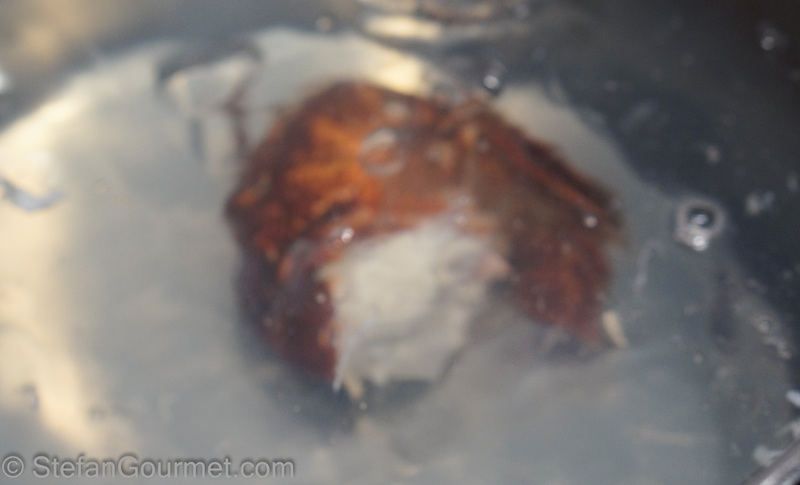 Love your article, and though I haven’t made lobster sous vide, ive poached it gently at lower than 60 degrees. I love Thomas Keller and his passion for food and perfection, but I don’t know how experienced he is with sous vide cooking. He seems to be more of a classically trained chef. I haven’t read that book. The title seems a bit off 🙂 Anyways, super helpful post, thanks again! The book actually erroneously specifies 60C/140F as the upper limit of the so-called ‘danger zone’ (which actually ends at 54.5C/130F) and does not specify any cooking temperatures below 59.5C/139F. Even beef sirloin is listed to be cooked at 59.5C/139F, which as you know will get you medium rather than medium rare. I’m pretty sure the lobster at a Thomas Keller restaurant will be outstanding — it is just the temperature listed in his book that I am doubting. Keller’s lobster and chocolate at the F Laundy was a disaster in our table’s opinion. Hi Igor, thanks for letting me know. Do you serve any sous-vide dishes at the restaurant? P.S. I had a look at the web site of the restaurant, but I can’t see the menu etc. because it is on iCloud?! Hi Stefan, wonderful post, but would you give me some advice on cooking frozen 8 oz. 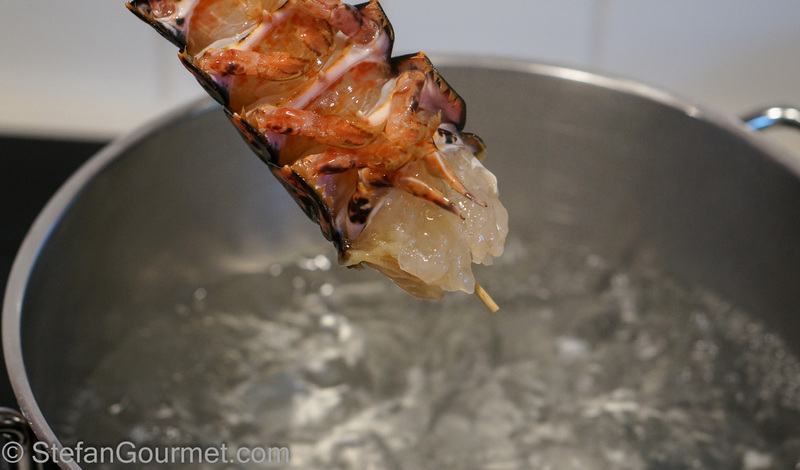 (sorry but I’m still trying to master the metric system) lobster tails in a sous vide bath? I just bought a box that were quit expensive and would like to hit a home run, or at least get on base, the first try. I’m interested mostly in safety especially since this post only talks about live lobsters. Do frozen lobster tails need to be pasteurized? Although being from the states I am not squeamish about eating lobster at the temperature you suggest. BTW – past experience found it very easy to extricate the tail from the shell by cutting the under belly with two clips from shears as close to the edges as possible. Thank you! Hi Leo, if the lobster was alive right before it was frozen and it has been kept frozen, there should be no need to pasteurize. The advantage to actual fresh lobster is even that the freezing will have killed any parasites. If you let them thaw in the refrigerator before taking the meat out of the shell and vacuum sealing (with a tablespoon of butter), regular cooking time and temp applies. 8 oz is substantial, so 30 minutes at 115F. If you prefer to cook them frozen, 60 minutes at 115F so they have time to thaw. Hope this helps! 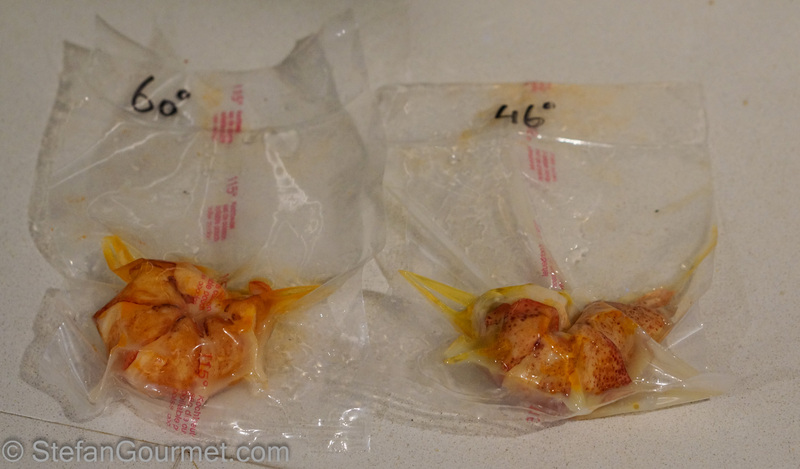 Please note that I have not cooked frozen lobster tails sous-vide yet, so I’d love to hear how they turned out. Hi Leo! Just wondering how’d your frozen lobster turn out? I want to try a similar recipe and if there were any adjustments needed. I tried your recipe, but felt like I would have preferred a little more springiness in the lobster. I’m going to try it at 139 next time. I’ll let you know how it turns out. Also, I tried to to boil for a min and take off the shell but found that it was easier to remove the shell without doing that step. Hi, if you like lobster to be “springy” then I think you will like 139 better. For me, springy is close to rubbery. I always use live lobsters — with frozen lobsters I can imagine that removing the shell may be easier without boiling first. Thanks for taking the time to let us know your findings! Hi Stefan, Just came across your blog via Googling Keller Lobster Tail. Does the size of the tail matter with cooking time? I have 12-14oz frozen tails that I will let thaw in refrig. Should I still sous vide for 15 minutes? Wow, those are big lobster tails! You will need 30-45 minutes for those. I’m curious if someone can help me on how to cook JUMBO lobster tails. I’ve got tails ranging from 5 oz all the way to 40 oz. I’m mostly struggling with cooking the 24 and up size. I’d also love presentation ideas. Mostly these tails are used for larger family gatherings where the tail is shared among many people. Sous videl, grilled, baked etc. Any suggestions are appreciated. Hi Charlie, with the bigger sizes you will need to increase the cooking time when you cook them sous-vide. The temperature will remain the same. If the lobster tail is twice as thick, the cooking time will be 4 times as long. I agree that there may be liability issues with publishing cooking temps that are below pasteurization temps but I do not think that this is the issue with Keller’s in this case. Poaching the lobster in beurre monte is amazing… you do not need a chamber vacuum sealer… just plop the meat into the sauce and poach. The left over lobster infused beurre monte sauce is really good for reuse on anything. Really worth trying, best lobster I ever had and I have cooked a lot of lobster. Not sure if this is applicable but interesting science, which may account for the utter scrumptiousness of Keller’s dish. He usses those temperatures because they’re in a published cooking book so according to FDA guidelines they have to be a certain temperature but I’m sure that he doesn’t use those exact temperatures in his restaurant.